Do animals have a language, and hence a mind, of their own? Why is that we humans have the gift of the gab while monkeys and apes, our closest cousins, can only manage gibberish? A widely held view is that their voice box is not sophisticated enough to articulate sounds the way we can. Darwin, however, suspected it had to do with their primitive cranium. 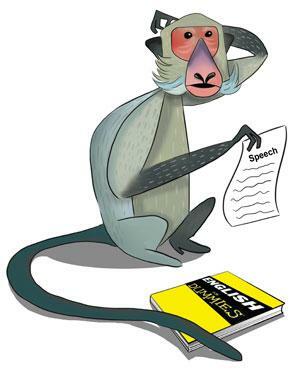 A new study, published in Science Advances, that explored the phonic repertoire of a long-tailed macaque supports Darwin’s hunch. Evolutionary biologist William Tecumseh Sherman Fitch III from the University of Vienna and neuroscientist Asif Ghazanfar from Princeton University trained the monkey to do a wide variety of oral gymnastics—yawning, eating, wincing, screaming, et cetera, and made a video of it. On careful analysis, they found to their surprise that there was nothing, at least in theory, in the anatomy of the macaque’s vocal apparatus that would come in the way of it talking like humans. So the only reason it cannot, they concluded, was that its brain is not hard-wired to make discrete sounds like vowels and consonants. In other words, primates, and for that matter most animals, do not have language because they don’t have the mental corkscrew, so to speak, to open the bottle of language. Fitch says their findings also suggest that anthropologists should stop looking at fossil record for evidence of when our ancestors learned to speak, as all of them had the speech hardware. Instead, he argues, we should be trying to figure out when we acquired the genetic software necessary for activating the vocal machinery. Some linguists believe the study could even account for the slight differences among various languages with respect to qualities like timbre and cadence, as different voice boxes could potentially give rise to different tongues. However, not everyone’s convinced about the study’s chief claim that primates cannot talk because they cannot think. For instance, in July this year, Durham University researchers trained, for the first time ever, an orangutan to mimic human speech. While conceding that we are the only species endowed with language, he goes on to describe many examples of non-verbal communication from the animal world, such as signaling of bees or the hand gestures of apes, and argues that the rudiments of what defines human—politics, culture, morality, and, in our case, language—are also present in other species. But while this would be sweet music for the ears of animal rights activists, the real challenge is to instill this new thinking in the popular imagination.